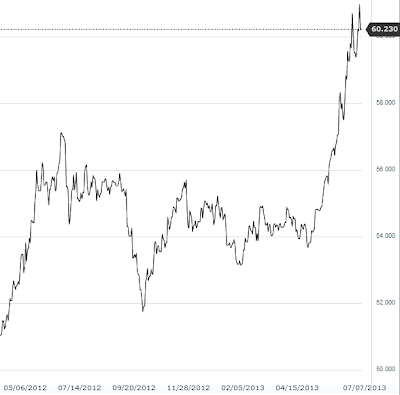 Indian rupee's slide to record lows has been extraordinary. It's been driven by weakness across emerging markets and rising rates in the US. As foreign investors exit (accompanied by domestic accumulation of dollars), India's central bank has been reluctant to intervene in order to halt the rupee's slide. While this is expected to help companies in service export sectors (IT services, etc. ), it will compress margins for other firms. Weaker currency raises input prices for firms that import parts, materials, etc. who are often not in a position to increase their output prices. The divergence between input and output prices in India is already visible. Moreover, firms such as Reliance and Bharti Airtel who borrowed in other currencies, are watching their liabilities rise when converted into rupees. Perhaps the most troubling aspect of this rupee weakness is the chart below which shows Brent crude oil denominated in rupees. For India, oil prices currently stand at recent record highs (except possibly the oil India buys from Iran at a discount). Given that domestic petroleum is generally subsidized by the government, this spike is sure to put significant pressure on India's fiscal balance.